It may be a Hoppy Easter, actually, as the mecha that Fradel Gonzales (slice151) has built has some pretty beefy looking legs. 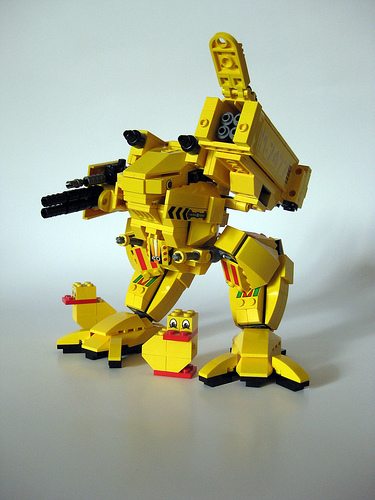 I picure this thing as leaping and bounding across the battlefield, not plodding like most mecha. My favorite part of the so-called Easter Whambit, though, is the cute eyes on the cockpit. It’s the perfect camouflage to blend in with those chicks. I’ll have to ask Fradel what a Whambit is, though.